– According to the World Diabetic Foundation, one in two people currently living with diabetes is undiagnosed. – WHO also states India as the diabetes capital of the world. And, WHO also estimates that 80 percent of diabetes deaths occur in low and middle income countries and projects that such deaths will double between 2016-2030. Research over the years has shown that Indians are at a higher risk of type 2 diabetes compared with Caucasians, and typically develop the disease up to a decade earlier and at a lower weight. Indians are generally blamed for their food habits, unhealthy lifestyles and accepting myths around diabetes. Clearly, the need of the hour is creating awareness of the chronic disease for people at risk of diabetes and diabetes alike. Earlier this year Adani Wilmar Ltd. (AWL), the leading manufacturer and distributor of cooking oils & food products, under its flagship brand Fortune, launched a pioneering product, Fortune VIVO Diabetes-Care Oil, which is India’s 1st diabetes care oil and the latest innovation in the Indian cooking oil segment. 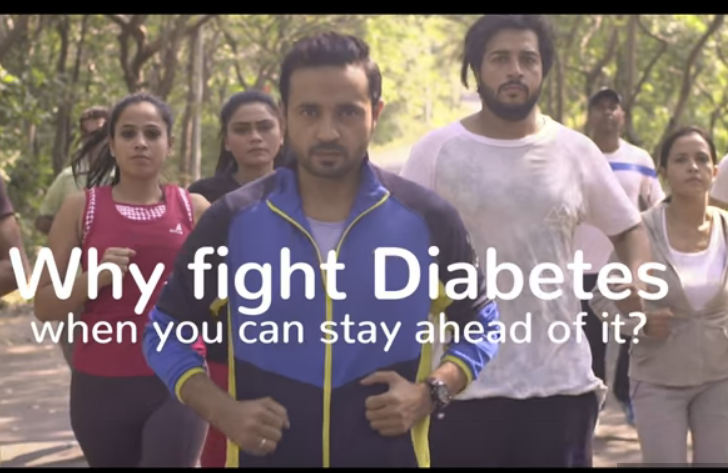 On this World Diabetes Day, AWL has launched a digital campaign – #MakeIndiaDiabetesFree. The campaign along with digital activities and a content portal is led with a video film. The minute long film conveys the message of how to stay ahead of diabetes, by living a healthy life, staying fit and eating nutritious food. The video has fetched more than a million views and a completion rate of 60% on YouTube. Apart from sharing the video and creating awareness, the brand has called in support from our PM Narendra Modi. Addressed to the PM, the open letter has asked the support and blessings. On Twitter the brand has roped in a nutritionist to clear the general myths around diabetes. The Twitter account is also sharing recipes of diabetic-friendly food from chefs. In addition to this, the brand is calling for stories from people who are staying ahead of the chronic disease. The portal is led with the video and human stories that will #MakeIndiaDiabetesFree. The portal is hosting a quiz (The Diabetes Detective) that will tell you in few easy steps whether you are affected by the disease. There are other features like Cooking Companion that is a hub of healthy recipes, Exercise Ally that is advising on how to be fit and get rid of stress, and Myth Bursting Mentor is the much needed feature that is bursting the diabetic myths. Education and awareness is the only way to eradicate diabetes. Even more so when we are the leading country in this disease category. Overall the campaign isn’t talking about how to face the disease but how can we stay one step ahead. Focusing on having healthy eating and living habits is a great call for the campaign, especially in this fast food world. “Our campaign #MakeIndiaDiabetesFree is inspiring individuals to stay ahead of this deadly disease by leading a balanced lifestyle of exercise and eating right with an overall happy outlook. Fortune is committed to helping diabetics fight the disease,” informed Angshu Mallick, Chief Operating Officer at Adani Wilmar. With the growing rise of individuals considering a healthy life, edible oil companies have also sensed the need of jumping into the market. However, the market percentage is about a percent in front of overall 23 million tonne demand for edible oils annually in India. But that didn’t stop Fortune from launching VIVO Diabetes-Care Oil, which is India’s 1st diabetes care oil. Introduced with a focus to eat away diabetes, the latest campaign is timed well with the theme of World Diabetes Day. The social media activities and the features on the portal are providing enough reasons to educate and burst the myths around diabetes, thereby making it a much required awareness campaign related to a chronic disease and at the same time, meeting the brand objective.